Nestled amongst beautiful bushland and a short 5 km drive to the Caboolture CBD, Bellmere on Richards is a luxury 4.5 star self catering holiday home, accommodating up to four (4) guests for one all-year-round booking cost. Extra guests can be accommodated to a maximum of nine (9) when sharing existing bedding. This stunning and beautifully appointed holiday home is located on five tranquil and secluded acres, yet is only a short drive to all activities and amenities within the Moreton Bay Region. The home boasts three (3) lovely bedroom with all of the little extras that make your visit special. There are two (2) well appointed and modern bathrooms and a modern fully equipped gourmet kitchen. The combined lounge and dining is comfortable and convenient with Foxtel TV and a dvd library while this area leads out onto an alfresco dining & BBQ area that overlooks the beautiful acreage. An abundance of birdlife and native wildlife grace Bellmere on Richards daily. Sit back and relax while taking listening to unique sounds and taking in the sights across the acreage. Our accommodation is perfect for guests attending family gatherings & reunions, weddings, local festivals, conferences, ​QSEC events, business & work people working in the area, short getaways and/or for guests wanting that special holiday experience. REST- RELAX - REJUVENATE for that special holiday experience. Shower chair (1), hand & shower soap, bath sheets/towels, toothbrush holder, mirrors. 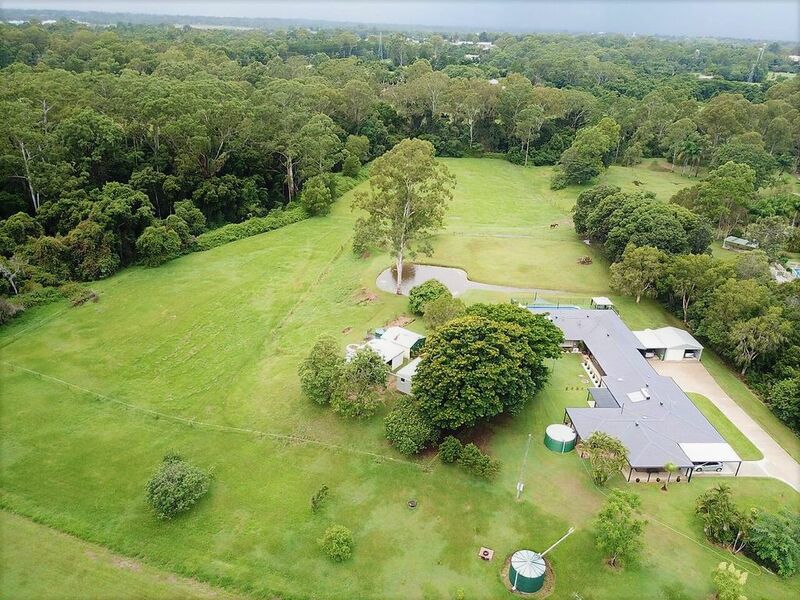 Stunning semi rural location on 5.5 acres & only 8 km from the Caboolture CBD. Full gourmet kitchen stocked with appliances, full size fridge, dishwasher, coffee machine. Sensational! - An absolutely amazing, delightful and stunning rural property with superb hosts. Our recent stay in this glorious accommodation was exceptional - blissful, peaceful, relaxing and a delight to the senses. The owners Vicki and Ken are exceptional hosts and the pride they take in their lovely property and in providing amazing and thoughtful guest accommodation and amenities was evident throughout our stay. Vicki and Ken could not have been more gracious and welcoming to us and our grandchildren who visited the property frequently. The thoughtful touches awaiting us on our arrival were so appreciated and included a freshly made, beautifully presented and delicious fruit platter, a box of chocolates, fresh flowers and guest biscuits. This sensational holiday home is fully self-contained, tastefully appointed and extremely comfortable. The home offers 4 beautiful bedrooms sumptuously decorated in various bright and stunning colour schemes. High quality linens and extremely comfortable bedding makes the sleeping environments in this home inviting and luxurious. The rest of the home is equally amazing. A spotlessly clean, bright, modern and spacious galley kitchen is stocked with everything you could possibly need for cooking, dining and entertaining. The 2 bathrooms are bright, modern and spotlessly clean, and the 2 living areas both offer a high degree of homely comfort. The main living area has a large modern TV and super-comfy arm chairs matched with an equally comfortable/roomy 3 seater sofa. The other (separate) living area is light and airy and is stocked with an extensive range of books/reading materials and games for guest use. A full separate laundry supplies all your laundry needs, including a washer/dryer combo, laundry detergent and a laundry trolley with pegs in case you prefer to use the outdoor washing lines for air drying. The outdoor areas of the property are stunning - guests are surrounded by lush natural scenery/bushland and wildlife in abundance - including kangaroos who visit regularly. The pool area is amazing and was a huge hit with the grandkids! The large undercover outdoor entertaining area is also outstanding and affords guests/visitors wonderful and tranquil views of the property whilst entertaining, dining or just simply relaxing. Overall, we cannot rate this exceptional holiday accommodation highly enough. We thoroughly enjoyed our experience at this absolute gem of a property. Thank you so much Vicki and Ken for your incredible hospitality and for making our stay so special! Thank you Bernd taking the time to review us & give a 5 star rating! Your kind words are very much appreciated. It was such a pleasure meeting you and your lovely family! Hope we cross paths again one day. Best wishes, Vicki. Lovely and private surroundings - Great Hosts! Our stay on this lovely property just worked perfectly for our family. The house was cleaned spotless as we arrived and Vicki and Ken presented us with a food platter that after a long day of driving from NSW was a great way to relax and settle in. Though the days were hot we rarely noticed as each bedroom has ceiling fans and air-con in the main living areas and the large verandahs surrounding the house kept the heat off any direct windows. Our hosts were willing to cater for our every need so we wouldn't hesitate to recommend this holiday house to our friends and family (which we have already done!). Many thanks for your lovely review Peter & Jenny! It was an absolute pleasure having you and your beautiful family stay with us. We are located 20 minutes from Bribie Island and water sports, 30 minutes from Australia Zoo and the mid Sunshine Coast activities. Advertised $220 nightly rate is for up to four (4) guests. Extra guests after four (4) are charged at $50 per person per night rate.